Who really benefits when pharmaceutical companies spend money on Humboldt’s doctors and nurses? When she's learning about new medications, Karen A. Moulton likes to order the salmon. That's her favorite at the Sea Grill in Eureka, where candlelight and cream-colored tablecloths await doctors, nurse practitioners and physician assistants being hosted by drug companies. The drugs being described vary, but the hosts are consistent: Pharmaceutical companies pay for the dinner, pay for the speaker and likely are not displeased if the Q&A veers to things the federal government forbids in other marketing. 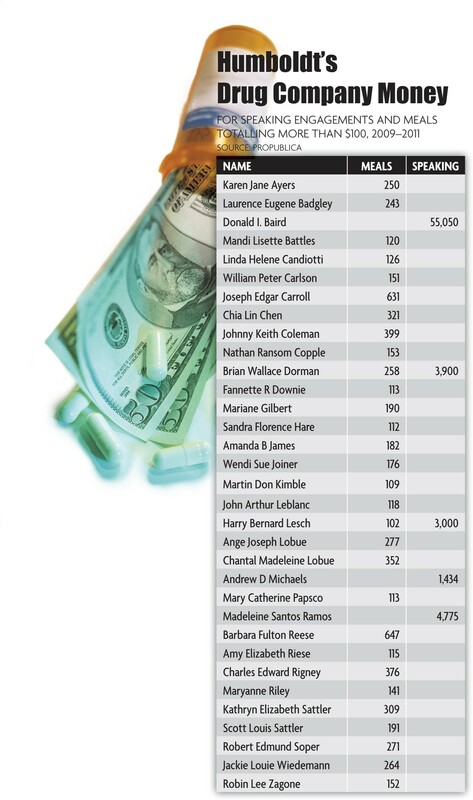 Dozens of Humboldt County doctors and health professionals have dined out on the drug companies' dime over the past three years, according to a new database prepared by the nonprofit news organization ProPublica. At least five have taken speaking fees, the database shows, ranging from the $1,434 that Lilly paid cardiologist Dr. Andrew D. Michaels to the $55,050 paid by Lilly and AstraZeneca to Dr. Donald Baird, who practices in Fortuna and Ferndale. At least a dozen, including nurse practitioner Moulton, have dining tabs for repeated meals that total more than $200. "I attend pharmaceutical talks pretty regularly," said Moulton. "I'm sure I've gone to at least six this year. " She goes, she says, "when I want to learn something." She figures the drug companies have a bias, but so does everyone else, including university researchers. For the most part, speakers and diners say, the talks help them learn and help them connect with other medical professionals who might face similar problems or refer patients to them. They don't think their patients mind. And most say they're certain that neither free food nor speaking fees affect which drugs they prescribe. Yet over the years, citing research into the psychology of gift giving and receiving, some doctors have called for more restrictions on drug companies' largess. In Humboldt, at least one doctor gives away his speaking fees in an effort to reduce any subliminal pressure. Dr. Brian W. Dorman, a Eureka urologist whose speaking and travel payments from Pfizer topped $4,000 in 2010, said he can't quite remember when he decided that drug company payments should go to charity. Last year he tallied them up and divided the total among Eureka's zoo, Friends of the Dunes and Miranda's Rescue in Fortuna. Dorman said he keeps giving the talks because he learns when he prepares for them, and he likes socializing with nurses, physician assistants and doctors he wouldn't otherwise see. "That I go someplace and give a talk and give the money to charity, I don't feel beholden to drug companies," he said. "If I kept the money, I wouldn't feel good about it. I don't think it would influence most physicians, but on talks like this, I wouldn't want to feel that I'm getting richer because of the talks." Dorman has given presentations about three competing drugs that treat erectile dysfunction and several others prescribed for overactive bladders. "Obviously the drug companies do this because they want to advertise their products," he said, and he presumes they wouldn't keep doing it if it didn't help business. That presumption is shared by many medical professionals. Dr. Bob Soper, a Eureka psychiatrist, suspects the dinners have some very slight influence in how willing people in general practice are to prescribe a new medication. It's not going to change anyone's mind about a clear-cut choice, Soper said, but not everything in medicine is clear cut. In his own practice, if medications he usually favors aren't working well, he will occasionally try a new one after hearing about it at a pharma dinner. The ProPublica compilation, which includes disclosures from some of the nation's biggest pharmaceutical firms, is an expanded, updated and more easily searchable version of data it released last fall. It's not complete -- so the Humboldt County doctors listed so far might have gotten more money from other companies, and names that don't appear now might pop up later. This round of information is based on voluntary disclosures by 12 companies -- just a fraction of those that will have to ‘fess up in 2013, when all drug and medical-device makers will have to report such figures to the federal government. Along with Dorman, asthma and allergy specialist Dr. Madeleine S. Ramos, who received $4,775 in speaking fees from Merck, and psychiatrist Dr. Harry B. Lesch, who got $3,000 from Pfizer, said the talks offer them a chance to teach, to learn and to rub elbows with others in health care. Some of the Humboldt recipients didn't want to discuss it. Michaels relayed a curt "no comment" via his office manager. Baird, who brings in the biggest speaking bucks, was on vacation when a reporter began calling and then declined to respond to repeated messages after he returned. Consumer advocates worry about drug company marketing because of a long history of accusations and proven tawdry episodes -- hyping benefits, downplaying risks, hiding data, ghostwriting academic research, and even trying to smear regulators. It's the kind of behavior that makes a nice dinner with a little wine at Avalon look tame. And yet some doctors and nurses say they value those dinners partly because they can hear about things drug companies aren't supposed to push: Off-label uses of medicines. The Food and Drug Administration, at least in theory, makes drug companies prove that their products are safe and effective. When extensive tests show that a particular drug helps, say, lower blood pressure, that's what drug companies are allowed to tout in their ads and on their labels. But drugs aren't simple, and they can work in the body in many different ways. Sometimes doctors notice that that same medication seems connected with other things -- who knows, maybe curing warts or settling upset stomachs. Word gets around, and presto -- there's a new "off label" use. The trouble is, sometimes those anecdotes turn out to be just coincidence, and an off-label use that takes off and drives profits isn't really helping anyone except pharmaceutical company investors. That's why companies are allowed to talk about data -- real scientific studies -- but not anecdotes, the stories that doctors and nurses tell each other from their daily practice. "A lot of that off-label stuff you'll hear at the meeting," said Chantal Lobue, a McKinleyville nurse practitioner. "You'll talk to the doctor after the presentation. They'll tell you. They're not supposed to, but they do." Earlier this month, Lobue went to a dinner about a psychiatric medication approved for treating schizophrenia. When questioned afterward, she said, the out-of-town speaker talked about the success he has had using it for unruly patients hospitalized with bipoloar disorder. Is there anything wrong with doctors and nurses and physician assistants sharing these tales from the front lines, comparing what works in a field that is still an art as well as a science? Probably not. Is there something wrong with drug companies laying the groundwork for swapping unproven stories that could help the sales of their pills? That might be something, as the TV ads say, that you should discuss with your doctor. Carrie Peyton Dahlberg was editor of the North Coast Journal from June 2011 to November 2013.